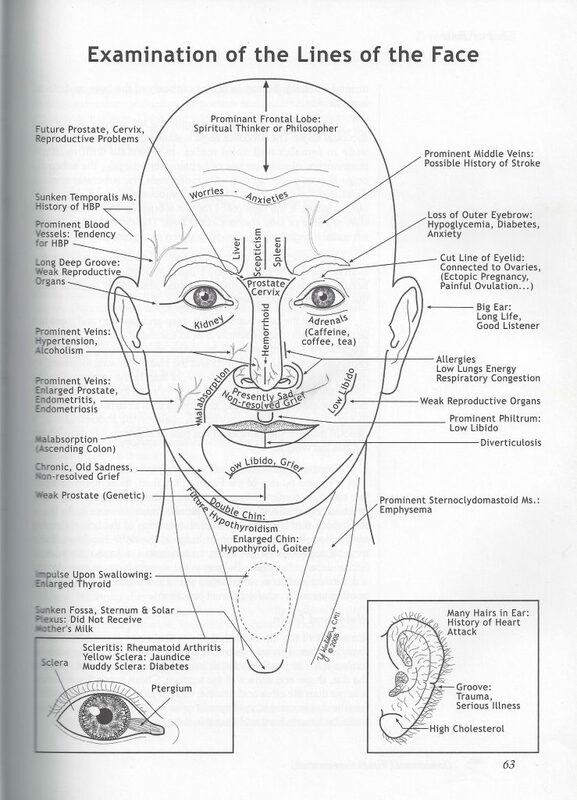 Ayurvedic Facial Diagnosis: What are the lines on your face revealing about your health? Although they say you should not judge a book by its cover, it is true that you can read a lot into your health by examining the lines on your face. 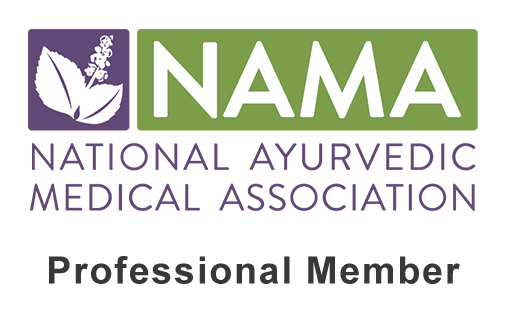 In Ayurveda, facial diagnosis is a common practice and powerful diagnostic tool, as is reading the tongue, nails, and pulse. Often this is done as a complementary practice to confirm ideas and findings, but also can reveal hidden secrets that may not have been completely clear. By reading the lines on a person’s face, one can reveal current disorders, past history of disorders, or even potential disorders to come. Since the lines do not tend to appear overnight, these telltale signs are often revealing chronic (long-term) issues such as malabsorption, low liver energy, weakness in the kidneys, adrenal fatigue, and even emotional disturbances such as unresolved grief. As you can see in this lovely illustration above, nearly every line on the face has a meaning to it. The deeper the groove, the more severe and chronic the issue may be. If the line is very slight but detectable, it is most likely pointing to an issue that is a bit more recent and mild. However, these issues should still be addressed since, without proper treatment, a mild disorder may eventually become more severe. If you are experiencing lines that run horizontally across your forehead, it is most likely due to a history of chronic worry and anxiety. These lines are telltale signs of this issue and in today’s society are all too common. Excessive anxiety and worry is considered a Vata disorder and can be pacified through Vata-reducing diet, lifestyle, and herbal treatments. Often called “laugh lines,” prominent nasolabial lines are actually a clear indication of malabsorption (nothing to laugh about). Malabsorption occurs when our bodies are not absorbing nutrients properly due to weak digestion, improper diet, toxins, inflammation of the GI tract, and other issues. 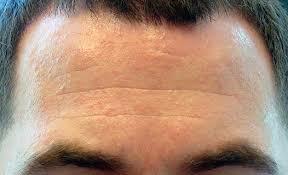 The more prominent the lines, the more serious the issue, and the longer the treatment process. Other physical signs of malabsorption include teeth marks on the perimeter of the tongue and vertical lines going down the nails. Treatment for this issue will vary according to the specific cause of the malabsorption. Read more on Malabsorption Symptoms and Ayurvedic Treatment here. 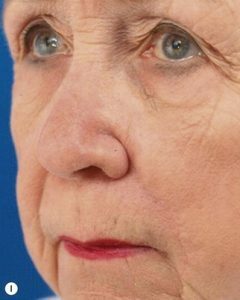 If you are noticing downward lines coming from the outer side of the lips (where the upper and lower lip meets), this is an indication of chronic, unresolved sadness and grief. Often called “marionette lines,” these lines can be caused by past trauma, unresolved childhood experiences, unresolved issues with loved ones, or a history of depression, among other causes. Dealing with unresolved grief is not easy, as it can bring up suppressed emotions that have been hidden away for quite some time. Everyone will have their own way to heal from grief, but the first step will be to examine where it is coming from and allow it the freedom to emerge. Some powerful tools for this are meditation, yoga, pranayama, journaling, therapy, and internal reflection. 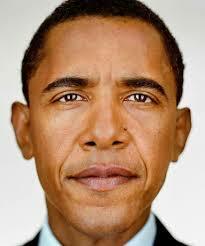 A vertical line between the eyebrows that lies fairly center is often an indication of chronic skepticism. It often indicates a long-term Pitta imbalance and can also be related to an individual who is overly headstrong, judgmental, or critical (all Pitta issues). If this is the case, Pitta-pacifying measures should be practiced, especially ones that deal with the mind and emotions. 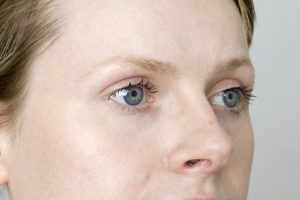 A vertical line that forms on the right inner eyebrow (between the brows, but more to the right), is revealing low liver energy, a current liver disorder, or potential future liver issues. Alternately, if the line is forming more towards the inner left eyebrow, this is a sign of low spleen energy and the possibility of a past, future, or current spleen disorder. These organ lines may be separate on some individuals, although commonly they are seen together. As with the skepticism line mentioned above, these lines are often caused by a Pitta imbalance and may stem from deep-seated, unresolved anger (a Pitta emotion). Try our Love your Liver Tincture! If the line between the eyebrows runs horizontally, this is indicating future prostate, cervix, or reproductive issues due to low energy in each respective area. 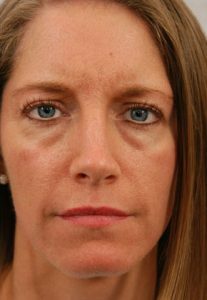 This line is a bit less common, but may be seen along with a few of the other facial lines indicating weak energy in these areas (read below). Since this line is said to be a future sign of these issues, one can use this knowledge as a guide to prevention, strengthening these organs before potential disease arises. 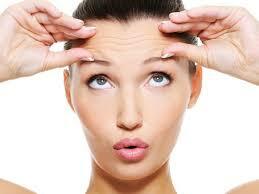 Bags and general puffiness under the eyes seems to be a common issue and annoyance for countless individuals. Many people relate it to being overly tired; however, there is actually a deeper root to this undesirable symptom. 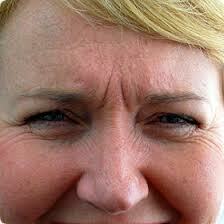 Bags under the eyes are a clear indication of low kidney and/or adrenal energy. This can be caused by many things including chronic stress, burnt out adrenals, long-term sleep disorder, excessive caffeine intake, genetics, high blood pressure, or diabetes. Treatment will vary due to the specific cause for that individual. 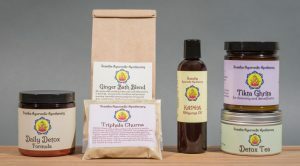 There are several herbs that focus on the health of the kidneys including punarnava and gokshura, and the adrenals such as tulsi, licorice, ashwagandha, and bala. These can be taken while also focusing on a proper diet and lifestyle regimen and, of course, removing the cause. 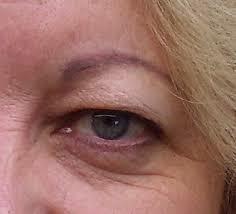 If there is puffiness over the top eyelid, this is an indication of low liver energy. This can indicate a current liver issue, but also may be a pre-symptom of a future liver disorder. Therefore, if an individual is experiencing this puffiness, appropriate treatment to heal and strengthen the liver should be administered as soon as possible. When you see an individual with blood vessels popping out over the temporal region of the forehead, this is showing a tendency of high blood pressure or hypertension. 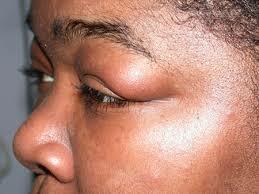 This is often a Pitta issue that is caused by excessive stress and anger (which leads to high blood pressure). Therefore, healing these emotions and treating the overall Pitta in the body and mind will help to reduce high blood pressure and reduce the bulging of the blood vessels. Click here to find out “How to Balance Pitta”. If you have begun to notice thinning of the outer eyebrows, this can be an indication of a few different issues. This hair loss may occur in diabetes, hypothyroidism, low blood sugar issues, or even chronic anxiety. If you are experiencing this issue, look for other indications of these multiple causes to reveal the most likely issue at play. For instance, if you are experiencing sudden, unexplained weight gain, fatigue, depression, and constipation along with the eyebrow hair loss, you are most likely looking at a thyroid issue and, therefore, should have your TSH levels tested. As always, the treatment will vary depending on the specific causes. If you notice a single, deep groove stemming from the outer eye and coming outward (we’re not talking about crow’s feet), it may indicate low reproductive energy. This can cause issues such as menstrual disorders, infertility, low libido, menopausal issues, impotence, and other related disorders. Often, treatment of these issues involves proper diet, lifestyle, and herbal treatment that will remove the cause and nourish these organs. If you notice deep grooves on the outside of the nostrils, this is showing low lung energy, chronic allergies, or a history of respiratory illness. This could be a general weakness in the area, although it most likely stems from a history of asthma, bronchitis, pneumonia, or something similar. When this deep groove is seen, one should work to strengthen the lungs with the appropriate herbs, while avoiding potential allergies and other triggers such as overexertion, etc. If there is congestion and mucus in the lungs, there is most likely a Kapha disorder; dryness and tightness will reveal a Vata condition; inflammation and infection presume a Pitta imbalance. Amazingly enough, even the lines on your earlobe can indicate your current health condition and future risks. 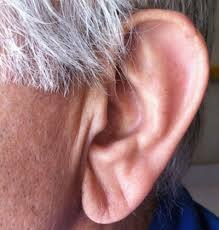 If you see a line that runs downward or sideways on the earlobes, you are most likely seeing a sign of high cholesterol and potential risk for future heart disease. These are both considered a Kapha disorder and, therefore, you will likely benefit from a Kapha-pacifying diet and lifestyle regimen while taking an herbal formula that works to reduce cholesterol levels and strengthen the heart. 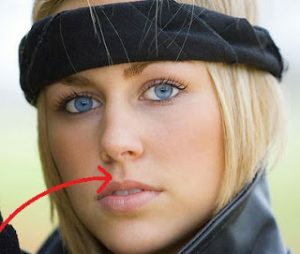 Although a prominent philtrum is often interpreted as an attractive feature, it is actually an indication of a low libido and potentially weak reproductive organs. Therefore, if you are seeing a prominent philtrum above your lip, you may benefit from a rejuvenating regimen that works to strengthen the reproductive organs and increase overall sexual potency. 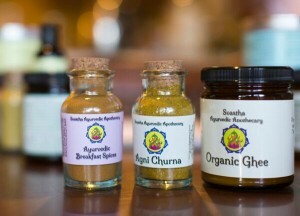 Read more here on how to increase the libido with Ayurveda. Although there is no denying how cute a nice set of dimples can be, according to Ayurveda they are actually a sign of low reproductive energy. 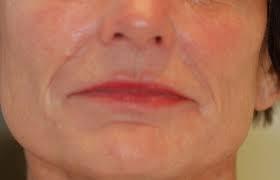 This may be seen as an obvious dimple in the cheek area (pictured here), or can also show up as a vertical line or crease where the dimple typically lies. Either way, this may be an indication of a current low libido, menstrual disorders, hormonal issues, impotence, infertility, or a future indication of issues to come and should be addressed accordingly. If your chin is sporting a horizontal groove (often curved slightly downwards), this is most likely an indication of deep-seated, unresolved grief held in the body. Alternatively, this may also be a sign of a low libido (or both). If you suspect unresolved grief, this can be remedied by using some subtle tools to release stored emotions, allowing them to be safely processed. This may include yoga, meditation, pranayama, self-care techniques, journaling, therapy, or talking with loved ones. Whatever method resonates with you, make it a part of your routine, moving slowly to avoid releasing too much emotion all at once! The classic dimpled chin has more meaning than just a unique facial feature. It may be a sign that there is a weak prostate (or cervix in females), and can be a prodromal sign of issues to come in these vital organs. Therefore, an individual with a dimpled chin should take precautions and strengthen the prostate (or cervix) before any obvious disorder occurs. 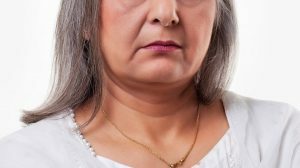 Not surprisingly, a double chin is considered a sign of a Kapha imbalance and can indicate current or future hypothyroidism. If this is the case, the Kapha should be pacified through diet, lifestyle, and herbal treatments while working to increase the metabolism to prevent or treat low thyroid energy. Now that you have a better idea of what the lines on your face are revealing, the question is: What can you do with your findings? Of course, this will look different for each individual since the causes of these issues may come from genetics, improper diet, improper lifestyle, or general misuse (or all of the above). Once you realize the potential health issues that are prevalent, you can examine further to find out the causes. While you work to remove the causes (this is not always easy), you can simultaneously take herbs, and follow the appropriate diet and lifestyle plan that will help strengthen the affected organs or systems. For example, if you have several lines pointing to low liver energy, you can examine possible causes. Perhaps you find there are liver issues prevalent in your family and you also have a mild history of consistent alcohol intake and deep-rooted anger (the liver is the organ of anger). You would then work to reduce the alcohol consumption while also taking some liver strengthening herbs such as Guduchi, Kutki and Neem. You can also perform a mild detox to flush out toxins and then go on a Pitta-reducing diet. You will also need to address any anger issues and work to create emotional balance while processing through volatile emotions that have been stored in your body. This can be done through meditation, yoga, pranayama, and other methods of healing the body and mind. Before trying out any magical wrinkle treatment, first examine a bit deeper and discover what your face is trying to tell you. Although some facial lines are easier to reduce than others, treating the root causes will not only give you a more youthful appearance but will also increase your inner health and wellness. Ayurvedic Nail Analysis: What do your nails say about your health? Awesome article, Danielle. I can attest to the loss of outer eyebrow hair due to anxiety. Incredible!